I´ve been eager to make this ice cream for a while now and will be great addition to this this winter season. 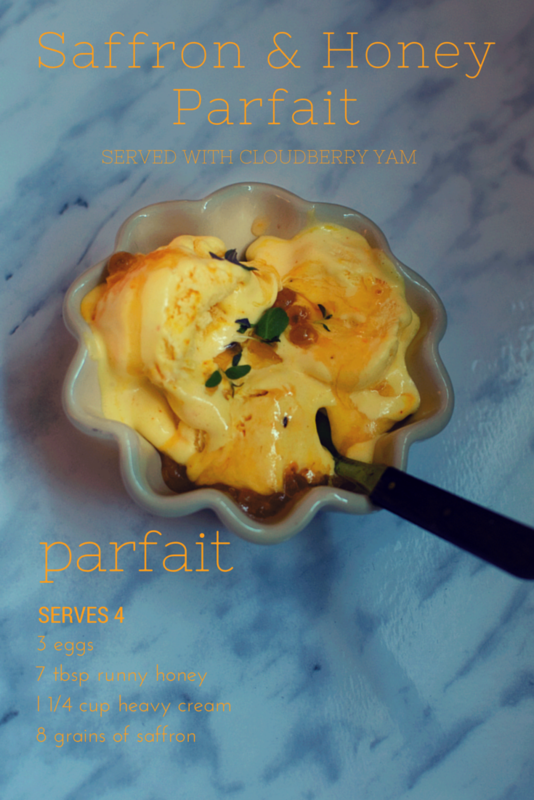 You will find that the taste of saffron and honey makes it the perfect winter ice cream/parfait. It melts in your mouth and offers a rich and creamy taste. In short, one of the best ice creams I’ve ever made. I use whole eggs and not only the egg yolks when making this particular ice cream. It´s one of the things I realized when I once accidentally used whole eggs. The ice cream turned out to be better in texture and taste then when only using the egg yolks. So I kept on making this ice cream the ”wrong way”. It somehow works very well with the saffron and honey and turns out outstanding. In a sauce pan heat honey and minced saffron under low heat. Put a side and let cool. In a medium sized bowl whip the cream with a electrical handmixer until it forms stiff peaks. In a large separate bowl whisk the eggs and sugar puffy with the electrical handmixer. Pour down the honey and saffron sauce into the bowl with eggs and stir until combined. Fold the whipped cream into the egg mixture. Gently stir until completely combined. Pour into a freezer-safe container with airtight lid or seal with plastic. Freeze until solid, at least 4-6 hours.